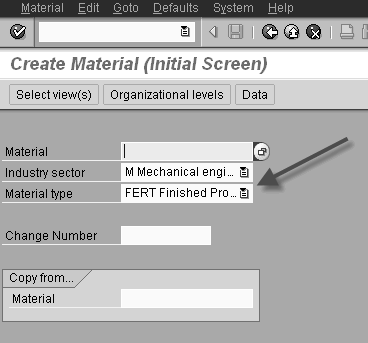 In Material Master records each material must be assigned to a material type. Material type specifies the attributes , features etc of that material. Common features and attributes are grouped together as a single material type. SAP system contains some standard material types. We can also create our own if don’t meet any standard type matching for our material. The following picture is the initial screen for creating a material. There you can see the filed for marking the material type. Its a good practice to remember the Id’s that you are mainly dealing with.